Indicator show signals for 16 Instruments/ Pairs (custom-able) based on a selected time frame with alert. User can select Maximum 8 indicators according to their choice among 16 available indicators & oscillators with changeable inputs. Indicator Automatically Adjusts its columns & rows based on the user input & can plot multiple Dashboard on the Same chart. Combine Trend Alert with two custom indicator signals. Select Alert Signals from 48 trend signals. Important Note: If you choose any alert for "Alert 1" or "Alert 2", then you will get single alert for that trend condition. If you choose both "Alert 1" & "Alert 2", then you will get the combined alert for those two trend conditions. For example, SAR Bullish + Bollinger Band Bullish Breakout. You need to have the specific indicators loaded on your indicator dashboard in order to get alert signals. For example, if you want to get alert for MACD, then you need to have MACD loaded on your dashboard. Important! 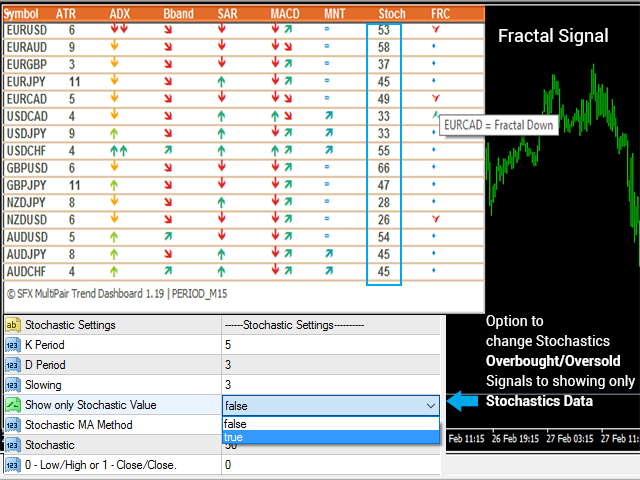 Fractal Bar Index 2 means, by default it scans fractals for last 2 bars. User Custom-able. If any fractal formed within last 2 bars, then it will show up on the dashboard. Important! For RSI Divergence you need to have ZigZag indicator installed in your MetaTrader platform, but not necessarily on the chart. By default, MetaTrader has it, unless you have customed or deleted it. This is a great indicator, it offers me several advantages. I make 2 different Dashboard lists for trading in the 4H and the Daily chart, this is handy. I also use 4 TA indicators and with this Dashboard, I have a quick overview of them which is great. For further analysis, the charts have to be consulted of course. Nevertheless, I can decide fast which charts need more analysis and which don't. This way, it saves me time and it becomes more easy to follow multiple charts in different Timeframes. I can recommend it to anyone who analyses multiple charts. Option added to show trend data for current chart only. Re-engineered the alert section. Now you can use two alerts side by side. You can use two trend conditions to trade a signal, as well as individually select your custom trend alert among 49 different trend signals. Added MA Cross signal with an alert. RSI divergence improved with ZigZag wave. Added Classic Bullish & Bearish Divergence with Alert. Added Hidden Bullish & Bearish Divergence with Alert. New Indicator Added RSI Bullish/Bearish Divergence. 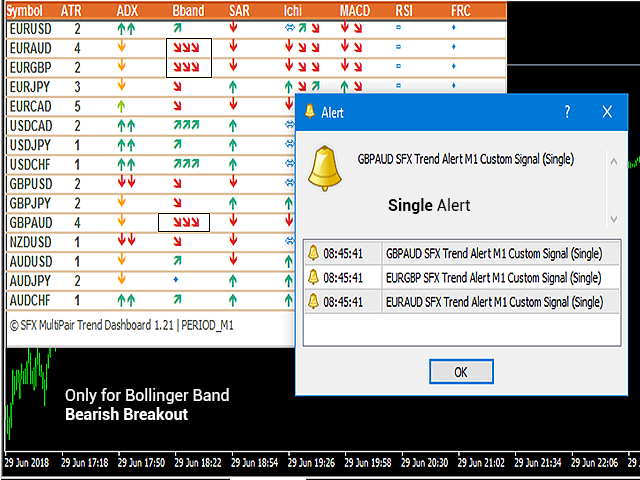 Breakout Signal Improved, you can get new high low or breakout signal alert for multiple custom time frame with email & notification alerts with custom bar index. Option Added for RSI & Stochastics To show Either Arrows (overbought/oversold signals) or Just the Numerical values as per trader choice. Bug fixed for Prefix, suffix based symbols. Now user can select maximum 8 indicators out of 14 indicators. More two indicators added, Fractals & Moving averages. New field for showing selected time frame & also to add custom chart name. Added 3 new sections for Ichimoku Kijun Sen / Tenkan Sen / MACD above or below signal line. Code Restructured to solve the indicator freezing problem. Number of Instrument Increased back to default. Auto table length adjustment Final improvement done. Number of pair decreased in order to improve performance. User can also select any trend indicator according to their choice. True/False option added. Optimized the code and decreased the number of pairs to speed up the terminal. No of pair decrease to speed up the loading. Added Day Breakout Alert for an intraday new high/low. Added Bar Index option - check with current bar or last bar. ADX data is now visible at the tooltip.